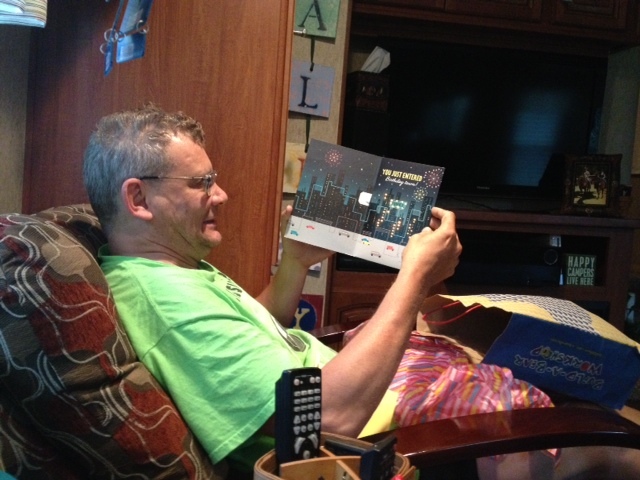 Today is Malcolm’s birthday, so first thing this morning, he got a gift and card from Val. 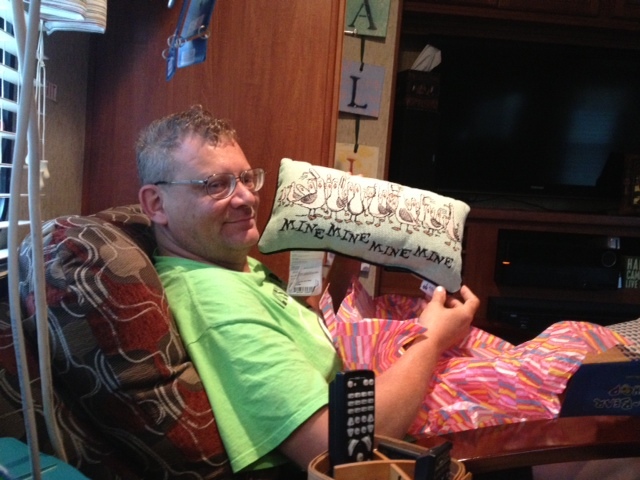 The gift is a pillow with the seagulls from Finding Nemo (mine! mine! mine!). Once we got showered up, we headed out to do a little shopping in town. We stopped by the boot store and the shoe store and escaped both without any purchases. From there, we headed to Pilot to fill the truck with fuel, then Cracker Barrel for lunch and finally the outlet mall where Malcolm found three shirts. After that, it was a brief stop at Family Dollar to get some pans for cooking birthday cake, some birthday decorations and a bag of what was advertised to be ice, but which turned out to be more of a solid block of frozen frosty stuff. Once back at the trailer, Val headed out with several of the ladies to visit a couple of the local wineries. Malcolm stayed at home and relaxed. This evening, there was a pre-rally get-together for dinner. Jim Beletti provided ribs and pulled pork from the smoker, and everyone else pitched in sides or other meats. It was all delicious. This entry was posted in Tennessee, traveling. Bookmark the permalink.